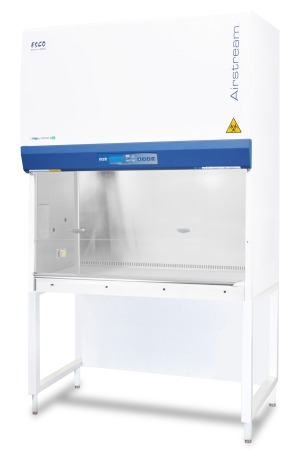 Esco, the world’s largest Biological Safety Cabinet manufacturer, has launched the new Airstream Generation 3 Biological Safety Cabinets - the most compact footprint and lowest energy consumption Biological Safety Cabinets on the market. Esco’s new Gen 3 Airstream Class II Type A2 Biological Safety Cabinets are the best choice for applications that can be served by a slightly smaller footprint BSC that has all of the same world-class features as the Esco full-size Labculture models. Now equipped with energy efficient DC ECM motor technology, these are the most energy efficient Class II Biological Safety Cabinets in the world, offering 70% energy savings compared to legacy AC motor blowers. The new four-foot Airstream BSC only consumes 285 Watts providing a large savings in annual energy consumption as compared to other BSC’s on the market. The Airstream microprocessor controller, centered and angled down for easy reach and viewing, displays all important information for fast and reliable operation. Utilizing high efficiency ULPA filtration which provides an ISO Class 3 work zone, and ISOCIDE™ powder coat on all its external and interior painted surfaces, customers are ensured that both operators and the external lab environment are protected from harmful biological agents. NSF 49 and UL 61010 certified, the new Gen 3 Airstream® Class II Type A2 Biological Safety Cabinets prove that Esco is the industry leader in biological safety cabinet design.